With the new year we began working on a new series of updates which will enable you to manage your campaigns! Click here to view! Now what is the IR mini recognition? I understand that the IR overlay touch support is for adding a touch screen ability to any tv screen. Precisely, we are planning to release a kit ourselves to attach an IR overlay to your TV-s and turn them into a Touchscreen via USB as a first step – sometime during the year – but we will support any kind of IR based touchscreen with the Toolkit, so you are not locked to buying from us. The IR mini recognition means that placing miniatures on the play-surface with the IR overlay recognizes the placed objects, and they can be paired up with digital tokens. 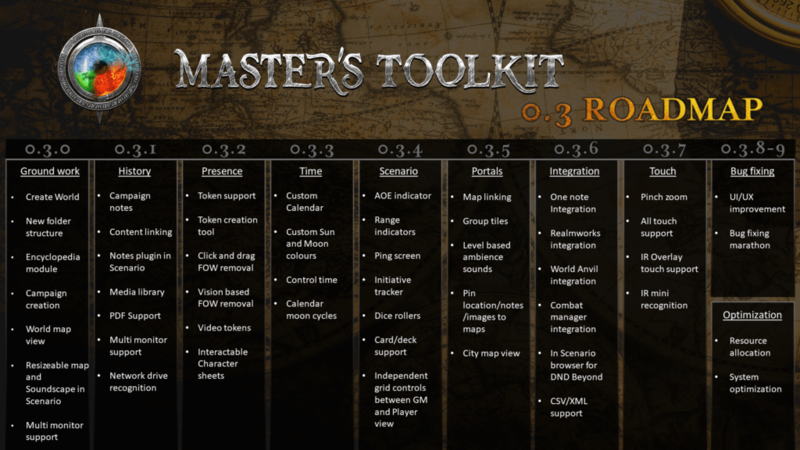 That way when you move your miniatures around, it will update your characters location in the Master’s Toolkit, updating its vision, range, and other indicators. This will be the first way for players to directly interact with the Toolkit. Awesome, I did look into The IR overlay to the TV’s but they are sorta pricey depending on how big of a tv you have! I am looking forward to this! The idea for the IR overlay is awesome!!! Having the physical to digital manipulation there for the minis would be awesome. I know it’s going to be awhile before we get there but just out of curiosity, do you guys have an estimate on how much it would cost to buy the IR kit from you? And, will the mini recognition work on regular touch screens too or just with the IR overlay? From my understanding it should work on both but I just wanted to make sure. The mini recognition won’t work on regular touch screens, as regular touch screens at capacitative, meaning they require a change in an electrical field in order to detect touches. If you put tiny magnets on the bottom of your minis, they should detect.